In 2011, when the Seattle Symphony performed music from “Legend of Zelda,” “Halo,” and “Super Mario Bros.,” classical aficionados learned what anyone who knew how to whistle the “Overworld” theme already knew: the art of video games partly turns on its indelible music. Yet as early as 2008, Seattle saxophonists Cliff Colón and J. Charles had recognized enduring 8-bit music through jazz in their Contraband project. Taking its name from Konami corporation’s run and gun style ‘80s era console game Contra, Contraband transcribed the game’s high-energy electronic score into a suite of action-packed jazz which echoed the original’s bracing cooperative gameplay and colorful 3D graphics. For Contraband’s sophomore release, Reloaded, the band is indeed reloaded, tackling other classic Konami themes from Metroid and Castlevania, in a larger ensemble adding Jacques Willis (vibes), Andy Coe (guitar), Farko Dosumov (bass), Thomas Marriott (trumpet), and David Marriott Jr.(trombone), to original members Colón, Charles, Eric Verlinde (keys), and D’Vonne Lewis (drums). 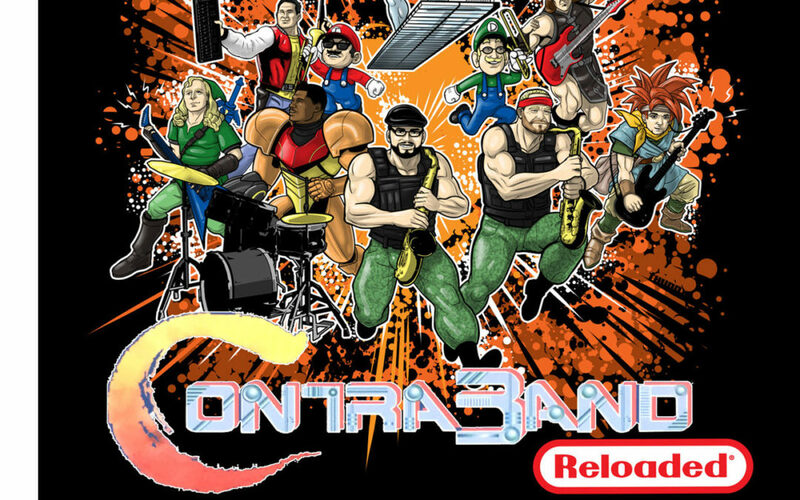 Like the near-superhuman warriors in the original Contra game, Contraband rely on their herculean instrumental powers to play their way through gnarly levels of fast-paced contemporary fusion. As on the first record, Colón and Charles stand out for their solos, Colón’s hearty tone on tenor pairing off with Charles’ brisk, but equally as fiery sound, turning the heroic shuffle of the original “Legend of Zelda” theme into a soul shakedown. Since many of the original songs were synthesized, some instrumental weight falls on the capable keyboardist Eric Verlinde, who nails fine details like backgrounds and more overt elements, such as the loquaciously baroque organ solo intro to “Castlevania III –Riddle.” Overall, the album does present an abundance of standout solos, as in the “boss level” of “Metroid – Kraid’s Lair,” in Coe’s unexpected metric variations, and with Willis’ rapid-fire vibe work, in which he re-sequences the main theme as if pounding cheat codes on an N64 controller. And that’s not to mention the rhythm section, especially the fine-tuned interaction between bass and drums, audible when Lewis and Dosumov revamp the theme to the online slot machine game “Secrets of the Forest” into a churning slow jam. Reloaded has a lot of surprises in store for those who’ve put their time in at the console, such as the addition of guitarist RL Heyer who shreds on the album’s closer “Silver Surfer,” to name one example. But even for those who don’t, the inventiveness, humor, and excitement of Contraband’s arrangements should intrigue any jazz fan ready to level up. Veterans of the Seattle scene and kindred “wise musical souls,” saxophonist Hans Teuber and bassist Jeff Johnson have aptly named their duo debut. The etymology of “deuce” traces back to the number two, but along the way has picked up the spice of the devil and the underworld aura of the gambling den: like rolling snake eyes, a deuce pins the player at their own game. Similarly, in Deuce, Teuber and Johnson lay down all their cards. With cunning turns of phrase, their swinging dialogue always seems to come to draws, sounding like the politic conversations of two close travelers on the whims of luck, the winds of change, and the ways of chance. Like any good match, Teuber and Johnson play on one another’s unique strengths. Teuber takes the upper register with his spiraling, boppishly decorative approach on tenor and alto saxophones, where Johnson joins him with his earthy melodies, double stops, and melodic slaps, sometimes doubled by the horn’s clapping pads. In its cool formal approach, the duo’s co-written original material—taking up most of the album—appropriately brings out the instrumentalists’ faculty for both song and sound. For “Hummingbirds” and “Let’s Pretend,” Johnson reveals his quick yet harmonically fine bowing, whereas Teuber tests a thin line between the horizontal motion of his melodies and the vertical of overtone clusters. For their aptly titled “Hot Rod,” based on a slick blues theme, Johnson cruises with guitaristic string vamps and quick switches, with Teuber’s fluttering lines running with it like a motor’s moving parts. Apart from their own material, the duo treats a few classic ballads, but remodels them in their own unbridled, swinging renditions; thus the pleading ode of Irving Berlin’s “How Deep is the Ocean?” becomes a playfully acrobatic burlesque, while the late-night advance of Bob Haggard’s “What’s New?” changes its setting from a lush ball to a bustling street somewhere downtown. The grit and grime of the blues, however, always lurks somewhere in the distance, stepping out on a notable cover of Jimmy Reed’s “Bright Lights, Big City.” Though they only outline the pounding rhythm of the original, its fundamental rock comes out in the almost palpable snap of strings and shiver of grace notes. Just as any great solo performer can convey the size and complexity of a full band from a just a few key resources, Teuber and Johnson handle their material together like a full band. At the same time, the indicative space they create between one another produces an intimacy which reinforces the sensitive, telling, and sometimes wild convictions of two of Seattle’s greats. If the United Nations’ General Assembly had a house band, it might sound something like Duende Libre. Negotiating on a platform of jazz and cool-fusion, Alex Chadsey (piano, composition), Farko Dosumov (bass), and Jeff “Bongo” Busch (percussion) entertain the music of Europe, Africa, and the Americas with both the strategic exuberance and cool-headedness of trained diplomats. Duende Libre return from the studio a year after their self-titled debut with Drift, sounding like a band that’s far surpassed its own sustainable development goals. On Drift, the band’s cultural confluence, which melded pre-existing alloys like jazz fusion and Afro-Caribbean music, has spread like its own musical confidence. Joined by vocalist Chava Mirel (who, like Chadsey, is another veteran of reggae royalty Clinton Fearon’s group), the trio focuses less on the familiar ‘70s Rhodes sound, to more on varied modes on its meditative and ingeniously immersive pieces. Chadsey writes now in gestures closer to that of his idols and peers, revealing his own voice further in the process. Hence it’s not hard to see where the album’s piano-based opener “Zephyr,” a suspensefully floating ode, takes its sophisticated and symphonistic structure if compared with tracks like “Choro,” Chadsey’s dramatic tribute to Jovino Santos Neto. As to the mix of traditions and approaches mastered by the entire band, their very rendering of these has become richer, not merely in solos but in comping and melodic statement. Dosumov’s upper register improvisations have a lyrically vocal quality, enhanced by the use of octaving pedals, though only part and parcel of the popping sound on the mix of hip-hop layout and afro-beat build up in the title track “Drift.” His tight groove with Busch stands out on the Chick Corea classic “Spain,” as well as the multipart “Subway.” For this track, Chadsey has the band switch from full-on funk to a more laid-back vibe, like ducking out of said transport’s crazed rush and climbing into the chill of the night. Here, listeners may take note of Busch’s melodic work on the cowbell, in addition Mirel’s bright harmonies in the background, featured throughout the album’s varied pieces. For “Bosphorous,” the trio mixes a Phrygian mode figure with a swinging Latin funk-march, describing a scene of a treacherous danger lurking among heightened nobility. Like the crossing of cultures at the seat of empires in the world’s most narrow strait, Duende Libre combines the various traditions around us into compelling stories of what we have in common. And while telling these stories, one can hear, too, how the group drifts into the unique hybrid of what it is itself.